While activities like ‘back to the board’ are fun for learners, practise comprehension and their ability to define a word, each item is treated in isolation – a point wholly at odds with the way language works in the brain. Comparison and contrast, on the other hand, not only encourage deeper and more critical thinking, but also help to build connections and networks of language in the mind. I wonder whether it might work to use ‘back to the board’ as an activity with an extended piece of a text – a short paragraph, for example – whereby learners ‘build’ a text by defining one word or phrase at a time. This could then be extended by examining together the vocabulary items in their more meaningful contexts, as well as looking at the overall cohesion and coherence of the text. When the whiteboard is full of language – which can be overwhelming for learners – highlighting or circling a small number of phrases to prioritise. These can be chosen by the teacher or democratically agreed by the group. Categorising lexis – I often choose a number of phrases – particularly functions – and write them on small cards (usually around 12 in total) then ask students in pairs or threes to organise them into three groups of four phrases and justify their choices. Often I’ll repeat the activity but with different sized groups – four groups of three, for example. What I like about this activity is that there are no right or wrong answers, which encourages learners to think critically and imaginatively to justify their choices, as well as notice similarities and differences between language items. Vocabulary elimination: learners (in pairs or threes) are presented with six topic-related words (or words which have recently come up in class) and have to choose which to eliminate. Again there’s no right or wrong answer, so their choice can be determined by meaning, association or form, but they have to be able to justify their choice. 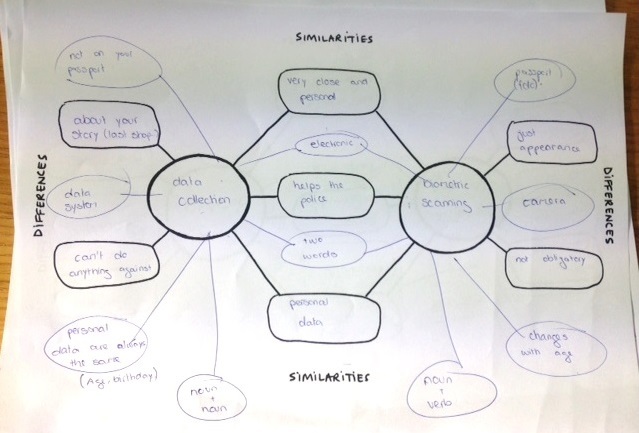 This process is repeated until the list is reduced to two remaining words, which learners then compare and contrast, identifying three similarities and three differences. 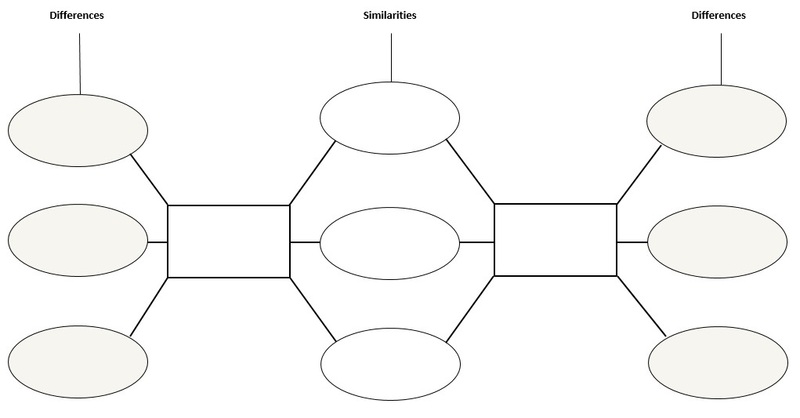 I’ve recently begun thinking about and researching the use of graphic organisers in ELT, and created a visual framework to aid this activity. In carrying out the ‘vocabulary elimination’ activity I felt that learners were significantly more engaged in the final stage of the activity than other groups had previously been when I’d carried out the activity without the graphic organiser. 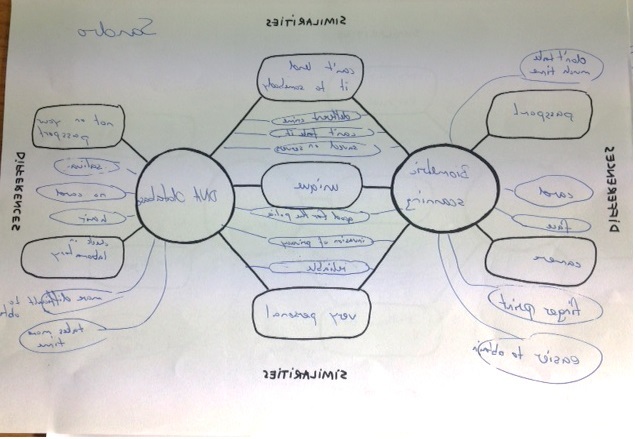 The organiser gave learners a framework within which to organise their ideas and the blank ovals created an impetus to complete the activity. Having ideas clearly laid out on a page also then facilitated passing round papers to compare ideas and (although I hadn’t planned to) I extended the activity by asking the pairs to add further ideas. 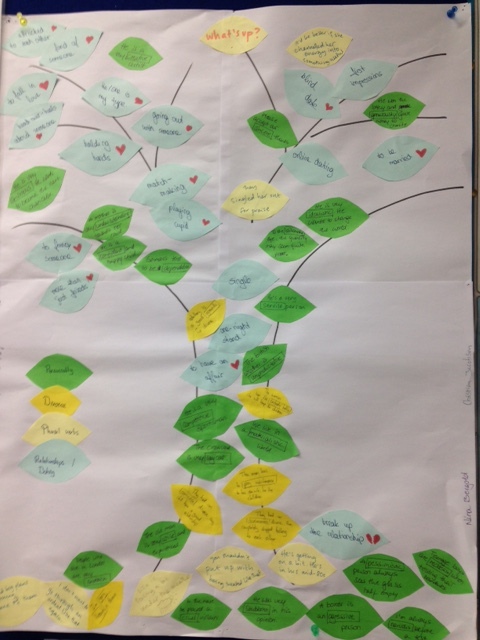 This brought in a competitive element which seemed to motivate students even further.